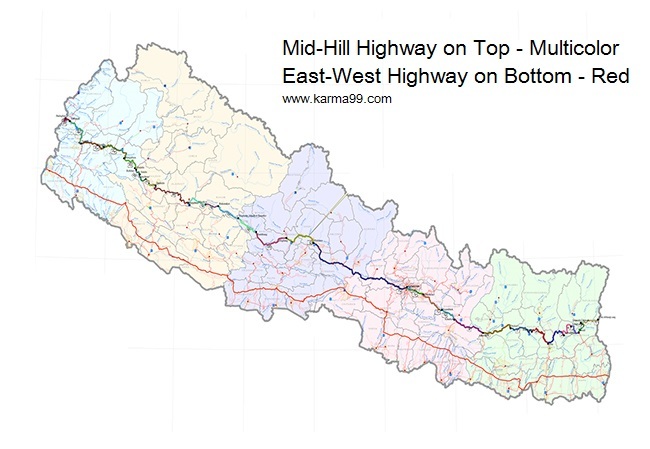 Mid-hill highway (मध्य पहाडी लोकमार्ग / Madhya Pahadi Lokmarga) is a under-construction highway in the hilly regions of Nepal which will run all the way from Chiyabhanjyang (Panchathar) in the east to Jhulaghat (Baitadi) in the far-west for about 1,765 kms. This highway will run somehow parallel to the present East-West Highway (1,024 km) which runs through plain area. About 1,000 kms road of Mid-hill hw is already in existence in different names whereas above 750 kms is new construction for which all tracks have been opened already. This highway will connect 24 hilly districts and 215 villages of the country. 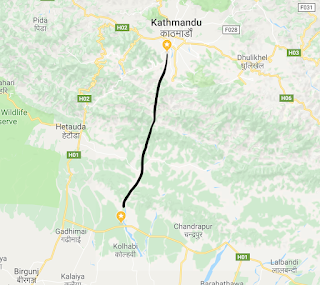 Districts that will be connected by this highway are: Panchthar, Terathum, Dhankuta, Bhojpur, Khotang, Okhaldhung, Udayapur, Sindhuli, Kabhrepalchok, Sindhupalchok, Nuwakot, Dhading, Gorkha, Lamjung, Kaski, Parbat, Baglung, Rukum, Jajarkot, Dailekh, Achham, Doti, Dadeldhura & Baitadi. Central point of this highway will be Pati bhanjyang, Nuwakot. It is one of the 21 nationally prioritized projects of the government of Nepal. The government is planning to establish 10 model cities along the mid- hill highway. Purposed 10 cities to set up model towns are Phidim (Panchthar), Basantapur (Terhathum), Khurkot (Sindhuli), Baireni Galchhi (Dhading), Dumre (Tanahun), Burtibang (Baglung), Chaurjahari (Rukum), Rakam (Dailekh), Sanfebagar (Achham) and Patan (Baitadi). These purposed model cities are expected to reduce the current migration from hilly region to Terai in search of food, Education, Health and other basic needs. 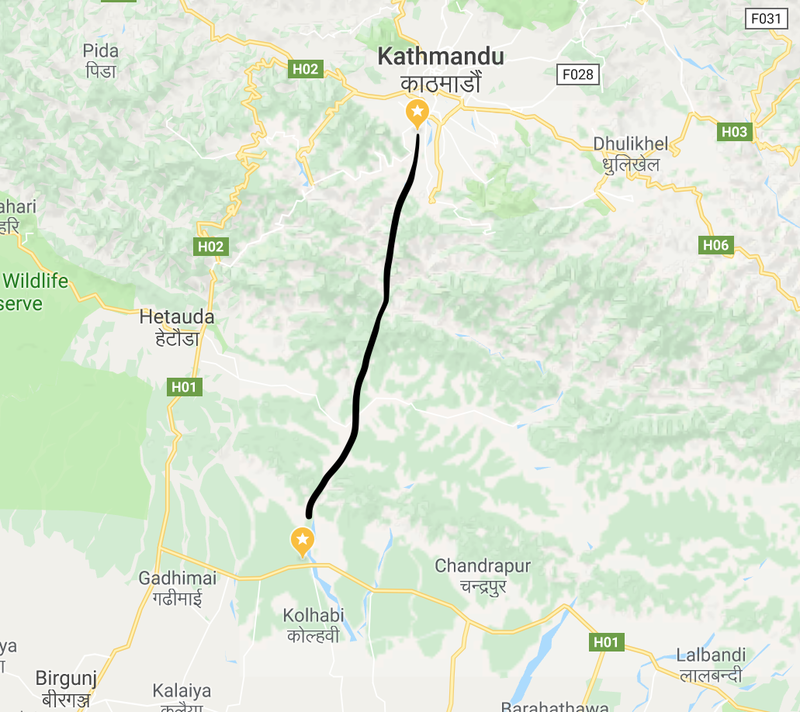 Kathmandu Terai Fast Track (काठमाडौँ तराई द्रुत मार्ग) is a Expressway under construction which joins national capital city Kathmandu to terai flatlands of Nepal within an hour. This project is categorized as a national pride project (राष्ट्र गौरव आयोजना) and expected to complete in 2022. 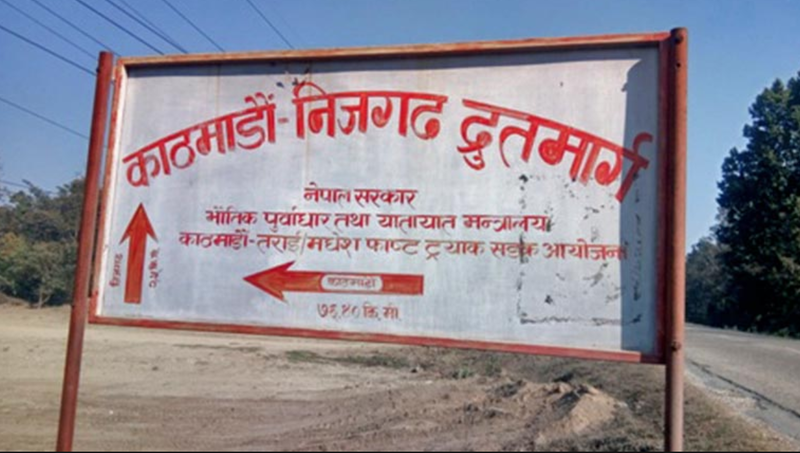 The 76.4 km long road will join Khokana suburb of Lilitpur to Nijgadh, Bara in State no 2 Madhesh. There will be a 1.5 KM long tunnel (in Thingan, Makwanpur), 99 bridges and 6 overhead bridges along the way. The road will be 23 meter wide in hill area and 25 meter wide in the plains. 2009 Nov 9: Nepal Army started opening track for fast track. 2013 Mar 10: Nepal army completed the opening of track and handed over to the gov. 2015 Mar 13: Govt decided to sign agreement to indian company ILFS to make DPR of fast track. 2015 Jul 31: ILFS made DPR according to which travel time will be under an hour. 2016 Nov 20: KP Oli cabinet cancelled the fast track construction deal with Indian company Infrastructure Leasing and Financial Services Ltd (ILFS). Company DPR had estimated price US $1,117 million for the project. 2016 Dec 22: cabinet formed a panel to study and consult about fast track construction. 2017 Feb 20: 7 member panel formed to study fast track submitted its report to gov, urging it to run the project on its own investment. 2017 May 4: Prachand Govt decided to give responsibility to construct fast track to Nepal Army. 2017 May 28: PM Prachanda laid foundation of fast track. It is expected to be constructed in 4 years. 2017 June 13: Nepal Army begin field assessment. 2017 June 22: Deuba cabinet endorsed the work procedure of fast track. 2017 Aug 11: govt officially handed over the fast track project to Nepal Army. 2017 Sep 20: Nepal Army said it will amend the DPR to reduce the height of bridges. 2017 Dec 13: Nepal army started tree cutting in Nijgadh sector for fast track. 2018 Jan 1: Army said fast tack is expedited. 2018 Jan 16: Nepal army announced to make their own DPR for fast track. The Kerung Rasuwagadi border was used for mutual transaction between Nepal and Tibet (China) for hundreds of years. But it was formally opened for bilateral trade in 2014 Dec as the alternative to the Tatopani border. When 2015 earthquake fully blocked Tatopani border, Kerung border emerged as the main trading point. In 2017 Aug 30, Keyrung border declared as the international border allowing citizens from third countries to cross as well. The Kathmandu-Kerung route can be divided into two segments: Kathmandu to Betrawoti, and Betrawoti to Kerung. There are three roads available for Kathmandu-Betrawoti segment. China completed Lhasa-Shigatse railway in 2014 Aug. Shigatse (Xigazê) is the nearest large Chinese city from Nepal. Shigatse-Kerung rail line in Chinese side is under construction and expected to complete by 2022. 2018 Jun 21: Nepal & China agreed to built Kerung-Kathmandu rail line in around 7 years during PM Oli's visit to China.